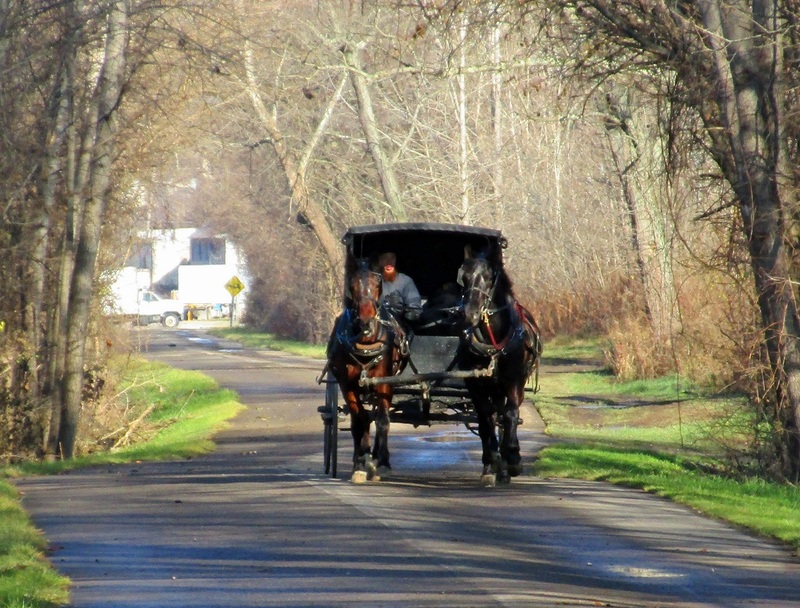 Holmes County Ohio is the site of the second largest Amish settlement in the world. With a reported June 2016 population of 34,190 Amish in 263 church districts it closely rivals the more famous and older Lancaster County PA settlement, which had a reported population of 35,070 but only 210 church districts. 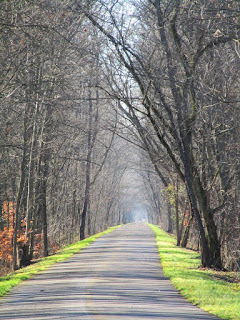 I recently hiked a rail-trail route through the heart of the Lancaster settlement, called the Enola Low Grade Rail Trail. That trail is very much a work in progress, some of it undeveloped, none of it paved or suitable for horses. But the route took me beside dozens of Amish farms and raised my awareness and interest in that distinctive community; so now that I'm hiking east central Ohio, just fifty or so miles from Berlin, Ohio, the unofficial capital of Ohio 'Amish Country', I wanted to take time to check that settlement and make comparisons. First thing I did was get on the internet; and there I found a pleasant surprise. 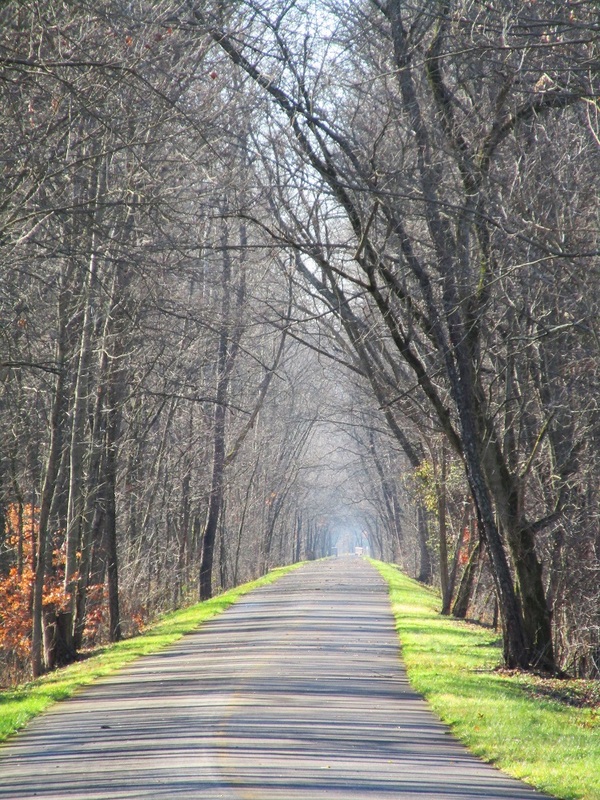 Holmes County also has a rail trail through the heart of its Amish region called simply the Holmes County Trail. Here the trail is a paved bike greenway. 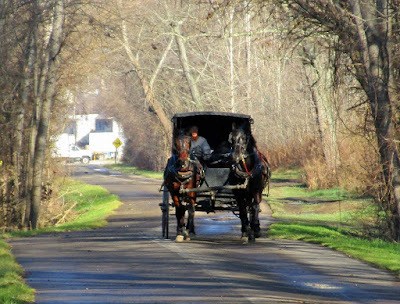 Though there are sections that remain unfinished, it's part of the 320 mile Ohio to Erie Trail that runs from Cincinnati to Cleveland; and best of all, it's the first (and only, as far as I know) public non-motorized trail that welcomes Amish buggies. 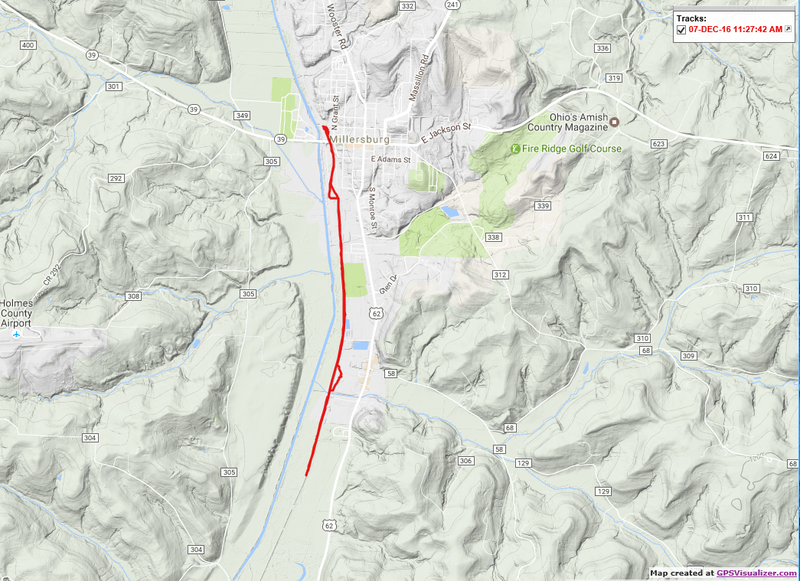 In fact, the trail goes right by a Wal-Mart store south of the county seat, Millersburg, which hosts an official trailhead access point, and which accommodates Amish buggies with a roofed hitching post area. I had time to hike only a few miles this sunny, icy day. But in that short hike I was passed by three other buggies beside the two-horse rig shown above, including a family that had just been shopping at Wal-Mart, an elderly couple, and two young ladies in this buggy. The section of trail I hiked did not take me past any Amish farms. It was passing through a wetland area and was parallel to noisy highway US 62. But its tree lined corridor offered its own special beauty. 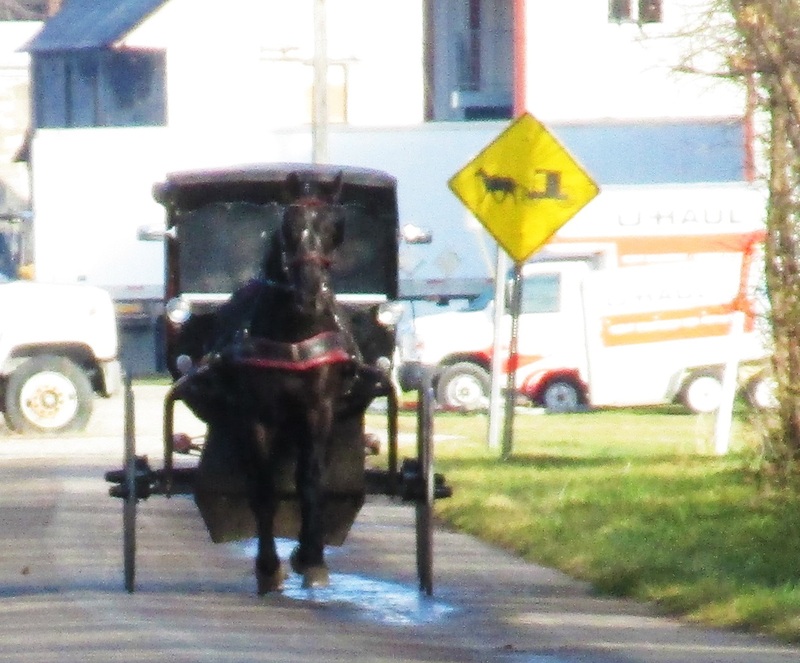 Old Order Amish buggies here in the Holmes settlement are painted black, compared with gray in Lancaster. That is evidence of a slightly more conservative Ordnung, their unwritten system of guiding rules, in Holmes. Lancaster Amish tend to place more emphasis on perfection/neatness/cleanliness of visual appearance of their farms and homes. From what I could see, the Holmes farms tend to de-emphasize outward appearance so that they don't really stand out from non-Amish farms the way they do in Lancaster. In fact, Holmes County is home to an ultra-conservative affiliation called the Swartzentruber Amish, whose farms are said to be deliberately 'unkempt'. They don't allow use of gravel on their driveways, so they tend to be muddy and rutty. This group prohibits ever riding in automobiles except for emergencies. They don't even allow the orange reflective 'slow-moving vehicle' triangles on their buggies, considering them too worldly, and they do not use battery operated lighting on their buggies either, sticking to the traditional lanterns. In my short time in the area I did not notice any buggies of this sort. A distinctive feature of the Holmes County settlement is that Holmes may soon become the first Amish majority county in the US. At present Amish comprise 42 percent of the county's population, and since Amish tend to have more children than non-Amish (Swartzentruber affiliation families average 9.3 children), that percentage is steadily rising. Here, for the sake of completeness, is the GPS track of my brief walk along the 'Amish Highway'.